February 2010 – To meet Brittany Hess is to see a vibrant, 28-year old woman with boundless enthusiasm and a passionate zest for life. This belies the fact that she has been courageously fighting an extremely rare soft tissue cancer called Alveolar Soft Part Sarcoma (ASPS) since age 19 when she was diagnosed in July 2001 at Stage IV. Her only symptom was a small lump on her left thigh, but by the time the lump appeared and was diagnosed, the cancer had already metastasized to both of Brittany’s lungs with over fifty tumors. Because traditional chemotherapy has not been shown to be effective in treating ASPS, since her diagnosis, Brittany has undergone 23 surgical procedures/ablations/radiosurgeries to remove or destroy tumors on her thigh and in her lungs, liver, brain, breast, tibia, spine, and abdomen, and she has participated in three clinical trials. Because of the rarity of ASPS, she and her parents have traveled all over the United States and Canada for various treatments. Through it all she remains optimistic, as she and her boyfriend recently bought a house together and have adopted a puppy they named Gizmo. After a year on the Cediranib Clinical Trial in Edmonton, Alberta, Brittany has miraculously had no new tumors for the first time since her diagnosis almost nine years ago, and she has had significant shrinkage/disappearance of her multiple lung tumors and an unresectable pancreatic tumor. She and her family are immensely overjoyed by these incredible results which they say exceed their greatest hopes and dreams from a year ago when Brittany’s cancer had become so aggressive and disseminated throughout her body, and her pancreatic tumor was diagnosed as untreatable. 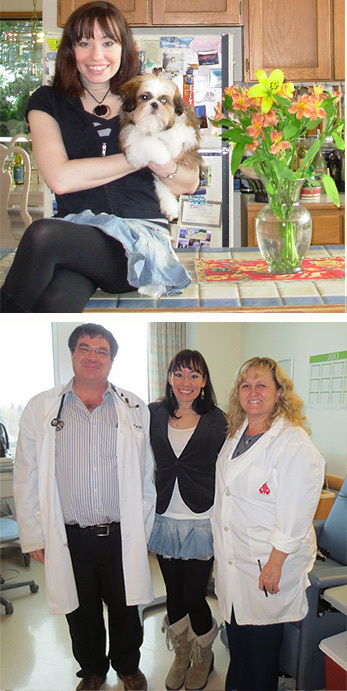 After almost nine years of fighting this very challenging disease, the financial burdens had become overwhelming for Brittany and her family, and the ongoing tremendous expense of travel and housing associated with required monthly trips to Edmonton for the Clinical Trial were threatening Brittany’s continued participation in the Trial. April 2012 Happy Birthday Brittany! We begin this New Year with hearts full of special joy and strengthened Hope from the VERY GOOD results of Brittany’s most recent scans and MRI’s. VERY thankfully, they all showed continued stable disease with no new tumors :-). While we celebrate with immense joy and gratitude Brittany’s continued disease stability and the priceless gift of her precious young Life, our hearts are filled too with ongoing deepest gratitude for all that all of you at Lazarex have done and continue to do to enable Brittany to participate in the Life saving Cediranib Clinical Trial. Thank you for all that all of you and Lazarex have done to make possible the continued Hope that brightens the beginning of our New Year. Since the last update Brittany has married and continues to participate in the the Cediranib clinical trial that is literally saving her life. Lazarex continues to provide financial assistance for her travel related expenses. Brittany has been a Lazarex VIP (very important patient) since 2010!